Price: GBP£29.99 / USD$54.95 Fw 190 in North Africa available online from Midland Counties Superstore and Specialty Press. Advantages: A day to day account with loss and victory records. I’m sorry to say that many out there might be disappointed. 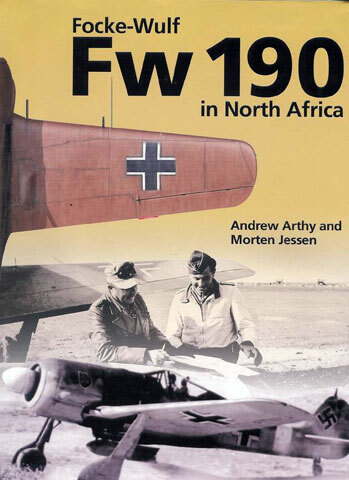 I too believed that this volume would be loaded with pictures and profiles of 190s in desert dress, with a discussion of the problems encountered by the this aircraft in the harsh desert conditions. This is a very different book. Not that there is anything wrong with it, on the contrary, it is quite nicely done. The authors set forth, in combat diaries, the day-to-day events involving the Fw 190 from its early introduction in July of 1942 to the surrender of Axis troops in Tunisia in May of 1943. The diaries focus on the service of the Fw 190 primarily with III. /ZG 2, II./ZG 2. III./SKG 10 and II./ JG 2. There is also mention of service with Erprobungkommando 19 in the very beginning and Sch.G. 2 at the very end. It also covers the 190s role in the battle of Kasserine. The combat diaries are based on archival documents and first person experiences. I must admit however, that to this reviewer, the diaries are less than exciting, being written in a thoroughly workman like manner. There are also brief biographies of some of the pilots who flew the 190s scattered throughout. For those who like detailed records, there are excellent appendices. The first covers aircraft and personnel casualties incurred by Fw 190 units in North Africa. It covers the period from the experimental introduction in July of 1942 and ends in May of 1943. There is also a list of aerial victories from 8 November 1942, when the Fw 190 first actually entered combat, through 28 April 1943. Finally, there is a list the 190s captured in Tunisia. There are a dozen nicely done profiles by Claes Sundin, which include a USAAF Spitfire a French P-40 and an interestingly marked captured Fw 190. Claim to this captured aircraft almost resulted in a shoot out between the RAF and the USAAF. But, contrary to what we might like to believe, nearly all of the Fw 190s in North Africa remained in 74/75/76. One of the profiles will arouse controversy - White 1 of EKdo 19 with the “E” on the rudder. Eagle Strike issued decals for this aircraft a while back on sheet 48027. Eagle Strike shows the aircraft as an over-painted 74/75/76 aircraft where the top was repainted 79, the sides 78 and the bottom left 76 with a yellow “E” on the rudder. Mr. Sundin shows this aircraft as being repainted 79 on the top and 78 on the sides and bottom with a white “E”. Since it appears that both are based on similar B&W photos, this one does not seem to be clear one way or the other. Of course there are pictures of pilots and the aircraft. A good number of the pictures are of damaged and captured Fw 190s. This is a nicely done work that is primarily directed at those who are interested in the combat history of the units involved and the events of the time, and I recommended it to those readers. The book also will be a valuable addition to the libraries of those who like to keep records of the losses and victories. I believe this work will be only marginally interesting to those who focus more on the aircraft itself.